Karl Wagner's only series character was the villain-hero Kane. 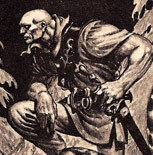 Many consider Kane the greatest figure in epic fantasy since Robert E. Howard's Conan, in part because Kane is no pale imitation of Conan, nor any sort of a genre character. In fact, when Karl starting writing his tales of Kane, well after the day of the pulps, he'd never heard of Conan, nor had the Rings trilogy reached the US. Kane is a creature purely of the mind of Karl Wagner. In the Kane stories the protagonist wars with his fellow man and with his creator. There are those who suggest darkly that Kane did, in truth, turn on his creator, bringing about, in a way, Karl's early death. Like Wagner's other works, the Kane tales are enjoying greater popularity than during his lifetime. Two deluxe volumes containing all known Kane stories have already sold out, and Death Angel's Shadow has been optioned by a film company. The Kane Short Stories A few of my own observations and kommentary upon rereadng the Kane short stories. Not all writings about Cain are writings about Kane, of course, but many essays, stories and poems have been inspired by Wagner’s account of the first killer. Some were respectful homages, always with Karl’s blessing while he lived. Others were disgraceful rip-offs, literary Lilliputians attempting to plug Karl’s concepts into their vacuous writing. I will leave it to our worthy visitors to distinguish one from the other. I finally dusted off my copy of "The Scroll Of Thoth" by Richard L. Tierney. line, so it can be had if you look. The Sword of Cain In February of ‘72, two years after Kane had made his one and only appearance in the blighted and little-noticed Powell edition of Darkness Weaves with Many Shades, a pretender appeared in the pages of Analog Magazine. The story (which is better than I‘d remembered) takes place in the future, rather than the past, but a future where street quarrels are settled with swords, with the organs of the loser the prize. Cain (here spelled Cain) is so strikingly similar to Kane that it is hard not to imagine that author Henry Sauter had come upon a copy of Darkness Weaves, liked it but was troubled by the many blunders (he could not have known they were all the work of wretched editing) and decided to freshen up the seemingly forgotten character. (Again, that scenario is imaginary.) This Cain says of himself, “I am Cain - with all the dark connotations from antiquity in my name and my work. Death is my realm - not life.” Later, another character, Borland, who seems to have been intended to become a regular in this saga, says of the swordsman, “‘Cain’ fits him rightly. All the death in the world is wrapped up in that man.” This story is not as close an analog - no pun intended - of Darkness Weaves as I’d remembered, though the mind-swapping episode is there, now accomplished by surgery rather than by magic. I’d recalled this story as being part of a three-part serial, though there’s no indication of that here, other than the fact that this story is plainly a fragment. I do recall that there was a letter-writing campaign undertaken by Karl’s small but devoted coterie of fans complaining of the similarities, and that Ben Bova responded to at least one of them (mine? not sure), to the effect of great minds thinking alike. But, for whatever reason, this story never reached the denouement suggested within it. I can find no other writing by Sauter except for "Solar Heating and Wind Power Available today!" in the January ‘76 issue of the same magazine. One wonders what might have happened if Henry Sauter had continued his own Cain saga while Karl Wagner’s Kane was absent from the field. From the Small World Department: the illustration that accompanied this story was by famed sci-fi and Mad Magazine artist Kelly Freas. Kelly was the guest of honor at the first sci-fi convention either Karl or I had ever attended; we came upon it by accident in the old Andrew Johnson hotel, the hotel where country singer Hank Williams, popular wisdom to the contrary, almost certainly died. Darkness Weaves was already in print but organizer Irving Koch had never heard of it or Karl and refused to let him in for free as was customary for published sci-fi/fantasy authors at such events. Karl always carried a bit of a grudge toward Irving after that. I’m sure Kelly wouldn’t have remembered Karl when he did this drawing - which, except for hair and beard, looks surprisingly like my own illustrations of Kane at that time - but they later became chums and often talked guns. Reflections on Stealers of Souls Does this cover have a familiar ring to it? Does it, for example, put you in mind of any Wagner stories? Any at all? Maybe one about a werewolf and a powerful warrior? 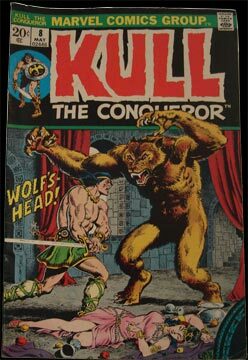 Certain knowledgeable wags said of this Kull story that it was a closer adaptation of a Wagner story than Marvel usually managed with Howard's Kull stories. Of course, that's just one point of view. This werewolf also looks remarkably like the one I did for Warner, though I can't imagine how Marvel could have seen it. Karl said of mine that it looked almost like the wolf of old Red Riding Hood illustrations, and that he'd never before seen a werewolf with a tail (common enough later on, though). This werewolf seems to be missing his tail. Also, the recurring Kull villain Thulsa Doom, whose first Marvel appearance is in Monsters on the Prowl 17, most often, through sorcery, much more closely resembles a certain hero-villain than the long-dead lich king of Howard’s description. Now Thulsa Doom is to get his own movie, though he will resemble James Earl Jones’ portrayal more than either the Howard or the Marvel version. Also, there will be more emphasis on Thulsa Doom’s nurturing qualities and his inner child. Cinematical columnist Elizabeth Rappe says of this metamorphisis, “Just once, wouldn't it cool to have a movie about a demonic sorcerer who happily eschewed the straight and narrow?” Yes. Yes, it would. I’ve seen a number of articles about Kane describing him as an anti-hero. This is not the case. Karl was very careful never to use that term in reference to Kane, and, as a scholar of literature as well as of history, medicine, and a number of other areas, he was well aware of the distinction. The American Heritage Dictionary defines an anti-hero as "A main character in a dramatic or narrative work who is characterized by a lack of traditional heroic qualities, such as idealism or courage." In other words, a nebbish, a nerd, a dweeb. Kane may lack some characteristics commonly associated with heroes, but he is no dweeb. Some notable anti-heroes in literature are Leopold Bloom in Ulysses, Don Quixote, Willy Loman in Death of a Salesman, Rabbit Angstrom in several Updike books, and, of course, my favorite, Tubby Tompkins, comic book antihero. Wagner would have been impatient with current tendencies, borne of ignorance or laziness, to include true villains under the term antihero. Grand villains, sympathetic villains and Byronic heroes, depite their wicked ways, have too many noble qualities, usually that of courage, to be confused with the timorous antihero. Indeed, a villain without courage is not much of a threat. A bad man has to at least have the guts necessary to rob the bank or to commit murder. Richard the Third, who dies in battle in the play, is not an antihero, he is a villain pure and simple, perhaps a hero-villain since he is the protagonist, but not an antihero. Antiheroes don’t scare us; they ‘re more likely to be scared of their own shadow. Kane is no antihero. Of course, Karl Wagner was not the first to write of Kane, under one spelling or another (the original spelling of “Kane” was in glyphs of a long-forgotten tongue). Of course there was the Biblical version, but that was only one side of the story.Then there was Buck Rogers’ nemesis Killer Kane, a possible influence, as Karl acknowledeged, on the spelling he chose. Here is a listing of a few appearances of Killers named Kane outside the writings of Karl Wagner(this will be a seperate page soon). Kane Morlock (spelling of first name not known), born with deformed strangler’s hands (Karl often rreferred to Kane’s hands - and his own - as “strangler’s hands.”) a character in an episode of The Sealed Book from March 19, 1945 titled “Hands of Death.“ At the end - spoiler here - Kane’s severed hands strangle his brother. In high school, long before Dr. Strangelove, Wagner used to do a very funny stick where he addressed his left hand along the lines of, “So... you thought yourself my equal as a surgeon? Well, since our little struggle cost me my hand, yours will now do my bidding.“ Then his left hand would begin quivering toward his throat. “Oh, no... no, I am your master... I’ve always been your master... you must serve me... >choke< “ ending with his left hand clutching his throat and his right struggling to tear it away. But his impromptu version was funnier. Killer Kane Arch nemesis of Buck, Coe “Killer” Kane (he had a good and kind brother named Nova) rose from the mean streets of Earth to become possibly the most skilled pilot of the space lanes... until Buck awoke from his centuries long sleep. According to one version of the story, Kane betrayed Earth and joined the forces of Mars (the Russo-American Mercantile conglomerate) in order to win the freedom of his love Wilma Deering, but soon was fighting for Mars for real, striving to become Governor of Earth. This depiction is from the TSR role-playing game, now out of print.